Kebabs (also kabobs or kababs) are various cooked meat dishes, with their origins in Middle Eastern cuisine. Many variants are popular throughout Asia, and around the world. In Indian English and in the languages of the Middle East, other parts of Asia, and the Muslim world, kebab is a broad term covering a wide variety of grilled meat dishes. 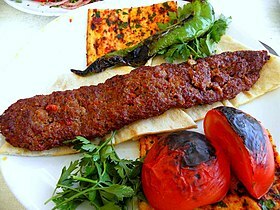 Although kebabs are often cooked on a skewer, many types of kebab are not.Kebab dishes can consist of cut up or ground meat or seafood, sometimes with fruits and vegetables; cooked on a skewer over a fire, or like a hamburger on a grill, baked in a pan in an oven, or as a stew; and served with various accompaniments according to each recipe. The traditional meat for kebabs is most often mutton or lamb, but regional recipes may include beef, goat, chicken, fish, or more rarely due to religious prohibitions, pork. In most majority English-speaking countries, two of the most prevalent and familiar kebab dishes are shish kebab and doner kebab. Either of these are often simply referred to as a “kebab” in English. Firedogs for skewers, Santorini, Greece, 17th century BC. Evidence of hominin use of fire and cooking in the Middle East dates back as far as 790,000 years, and prehistoric hearths, earth ovens, and burnt animal bones were spread across Europe and the Middle East by at least 250,000 years ago. In ancient times, Homer in the Iliad (1.465) mentions pieces of meat roasted on spits (ὀβελός), and excavations in Santorini unearthed stone supports for skewers used before the 17th century BC. Kebab dishes originated in the medieval kitchens of Persia and Turkey. They were generally made with smaller chunks or slices of meat, or ground meat, often cooked on skewers over a fire. This cooking method has a long history in the region, where it would be practical in cities where small cuts of meat were available in butchers’ shops, and where fuel for cooking was relatively scarce, compared to Europe, where extensive forests enabled farmers to roast large cuts of meat whole. The word kebab came to English in the late 17th century, from the Arabic: كَبَاب‎ (kabāb), partly through Urdu, Persian and Turkish. In Persian, the word is borrowed from Arabic. According to Sevan Nişanyan, an etymologist of the Turkish language, the Turkish word kebapis also derived from the Arabic word kabāb, meaning roasted meat. However, it is not often found in early medieval Arabic books, and only became commonly used in relation to cooking in the Turkish period. The word was first mentioned in a Turkish script of Kyssa-i Yusuf in 1377, which is the oldest known Turkish source where kebab is mentioned as a food. However, Nişanyan states that the word has the equivalent meaning of “frying/burning” with “kabābu” in the old Akkadian language, and “kbabā/כבבא” in Aramaic. The American Heritage Dictionary also gives a probable East Semitic root origin with the meaning of “burn”, “char”, or “roast”, from the Aramaic and Akkadian. These words point to an origin in the prehistoric Proto-Afroasiatic language: *kab-, to burn or roast. According to Ibn Battuta, a Moroccan traveller, in India, kebab was served in the royal houses during the Delhi Sultanate period(1206-1526 AD), and even commoners would enjoy it for breakfast with naan. Javad Alizadeh (Persian: جواد علیزاده‎ Javād Alīzādeh Persian pronunciation: [dʒævɒːd(-e) æliːˈzɒːde]; professional name: Javad; born 9 January 1953) is an Iranian professional cartoonist best known for his caricatures of politicians, comic actors, footballers, and for his scientific/philosophical column (including cartoons, caricatures and satire) titled 4D Humor, which has won awards from Italy, China and Japan. An active artist since 1970, his works have been published in international publications. He is the founder of the leading monthly cartoon magazine Humor & Caricature and is its founding and current publisher and editor-in-chief. Caricatures can decrease violence and bring cultures closer. They aim to promote peace and teach us to be moderate and laugh at our problems. Alizadeh was born on 9 January 1953 in Ardebil, northwestern Iran, and graduated BA in English translation. Influenced by his university degree, he considers writing and drawing cartoons as a tool that can translate sufferings, hardships and the mysteries of life into humorous language. In 1990 he founded his monthly cartoon magazine Humor & Caricature and since then he has been the editor and publisher of this independent and private publication.This humorous magazine publishes both pictorial and written humor about various subjects such as politics, sports, cinema, music and philosophy. According to the official website of the magazine, the purpose of the publication is “to promote peace, laughter, tolerance, moderation and multidimensional and multilateral insight in Iraniansociety“. Alizadeh has also attended numerous cartoon conferences in Japan, Malta, Turkey, Bulgaria, Finland, and has served on the jury of the Skopje 86, Anglet( France ) 91, Dubai 2002, Izmir 2008 cartoon festivals and Tehran Cartoon Biennial in 1993, 1995, 1997 and 2005.He has experimented with different styles and genres of humor such as editorial, gags, portrait caricatures and black caricatures, black humor, comic strips, sport humor, surrealistic and philosophical humor, and his works have been published in many leading foreign presses and publications in the 1980s and 1990s by C & W syndicate, including Who’s Who in Satire and Humor, Nebelspalter, Chicago tribune, Courrier International, Graphis annual, Osten, Mondial. A former staff writer and editor of the Witty World cartoon magazine, Alizadeh is a member of the international Cartoonists & Writers Syndicate. He also holds membership of the Good Humor Party, a humorous party in Poland. Alizadeh created a humorous mascot called Mad Commentator (Persian: مفسر شوت‎) who rose to fame after correctly “predicting” the result of the opening match between Argentina and Cameroon at the 1990 FIFA World Cup. Influenced by Albert Einstein and Isaac Newton, he created a scientific/philosophical cartoon on the Theory of Relativity entitled 4D Humor. He has also published a column (including cartoons, caricatures and satire) in his monthly magazine of the same title. In 2005 the website of the World Year of Physics carried a link to his cartoons about relativism on its “play physics page”, showing his scientific cartoons. In October 2008, his scientific cartoon on twin paradox in special relativity was shown and studied in the reading class and conference held by CERN Courier.com (The International Journal of High-Energy Physics site) in Trieste, Italy. Barbari bread (Persian: نان بربری‎ translit. Nān-e Barbari) is a type of Iranian flatbread. It is one of the thickest flat breads. It is widely known as Persian Flatbread in United States and Canada. Barbari means “of or related to Barbars” in Persian. Barbars are a group of people living in Khorasan near eastern borders of Iran. According to Dehkhoda Dictionary of Persian Language, this bread was baked by the Barbar (Hazara) people and was brought to Tehran, becoming popular during the Qajar period. In Iran, the Hazaras were known as Barbari (“barbarian,” “foreign,” “uncivilized”), which they resented. Reza Shah of Iran granted them the name of Khavari (“Easterners”) through a decree, and since then, the name Barbari has been abandoned and no longer applies to the ethnic group. 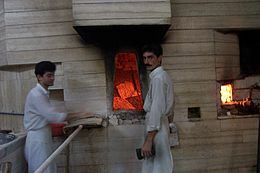 However, the bread is still referred to as Nan-e Barbari (bread made by the Barbarians) in Iran while Hazaras refer to it as Nan-e Tandoori (bread made in the Tandoor oven). The bread is usually between 70 cm to 80 cm long, and 25 cm to 30 cm wide. It is the most common style baked in Iran. It is served in many restaurants with Lighvan cheese, of ewe’s milk, similar to feta cheese. Taftan, taftoon or taftun (Persian: تافتون‎) is a leavened flour bread from Persian, Pakistani and Indian (notably Uttar Pradesh) cuisines, baked in a clay oven. This bread is made with milk, yoghurt, and eggs. It often flavoured with saffron and a small amount of cardamom powder, and may be decorated with seeds such as poppy seeds. 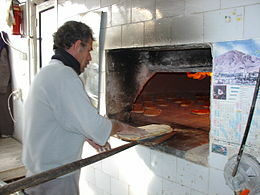 Sangak (Persian: سنگک‎, Azerbaijani: Səngək; or nan-e sangak نان سنگک) is a plain, rectangular, or triangular Iranian whole wheatleavened flatbread. Its name consists of two parts: ‘Sang’ in Persian means stone or pebble and ‘sangak’ means little stone. The bread is baked on a bed of small river stones in an oven. There are, normally, two varieties of this bread offered at Iranian bakeries: the generic one which has no toppings; and the more expensive variety which is seed bread (this is, topped with poppy seeds and/or sesame seeds). Sangak bread was traditionally the bread of the Persian army. It is mentioned for the first time in the 11th century. Each soldier carried a small quantity of pebbles which at camp were brought together with the “sangak oven” and used to cook the bread for the entire army. It was eaten along with lamb kabab. The bread has always been widely eaten in the territory of present day Iran and Azerbaijan, but following the Soviet takeover in 1920, the bread fell into some disuse. Because sangak is made by hand, the Soviets opted for mass production of loaves, an option which was not doable for sangak bread. Sangak in neighboring Iran however, remained having its same popularity. Lavash (Armenian: լավաշ; Turkish: lavaş; Kurdish: nanê loş‎; Persian: لواش‎; Georgian: ლავაში)[note 1] is a soft, thin unleavenedflatbread made in a tandoor and eaten all over the South Caucasus, Western Asia and the areas surrounding the Caspian Sea. Lavash is one of the most widespread types of bread in Armenia, Azerbaijan, Iran and Turkey. In 2014, “Lavash, the preparation, meaning and appearance of traditional Armenian bread as an expression of culture” was inscribed in the UNESCO Representative List of the Intangible Cultural Heritage of Humanity. 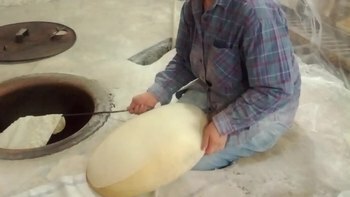 In 2016, making and sharing flatbread (lavash, katyrma, jupka or yufka) in communities of Azerbaijan, Iran, Kazakhstan, Kyrgyzstan and Turkey was inscribed on the list as well. Most modern food specialists claim that it originated in Armenia, whilst others state that it probably originated in the Middle East. 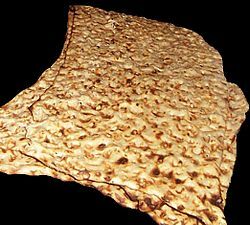 According to Peter Reinhart, “Lavash, though usually called Armenian flatbread, also has Iranian roots and is now eaten throughout the Middle East and around the world”. In 2014, Lavash was described by the Intangible Cultural Heritage of Humanity as “an expression of Armenian culture”. This decision led to protests in Azerbaijan, Iran, Kyrgyzstan, and Kazakhstan as they claimed that the food was “regional”, not “Armenian”. In Sabirabad District of Azerbaijan after the wedding when the bride comes into her new house, her mother-in-law puts lavash on her shoulder and says: “Let you come to the house of wealth, let your foot be lucky”. In the Novkhanisettlement, after a funeral, it is customary for people to prepare kyulchya, which sometimes consists of halva wrapped up in lavash. Dariush Eghbali (Persian: داریوش اقبالی‎) better known by his stage name Dariush is an Iranian singer. best known for his warm and poignant bass voice heard in both ballads and socio-political songs. He is also a social activist who has been promoting education, awareness and prevention with regards to social maladies. Dariush was born in Tehran, on February 4, 1951. His musical talent was first recognized at an early age of nine, when he appeared on stage at his school. Hassan Khayatbashi introduced him to the public at the age of twenty through Iranian national television. He immediately became popular with his legendary song “Don’t Tell Me You Love Me”. (Persian: به من نگو دوست دارم be man nagu duset dāram)  His contemporary and unique style opened up a new era in Iranian music. His work consists of over 208 songs in over 27 albums. He has also performed in 2 Iranian movies. Dariush’s song Dastaye To (Your Hands) was named as the Most enduring song in Iranian Music history by Manoto TV. Dariush is a member of Amnesty International. Having had the experience of drug abuse himself in the past, he is heavily involved in bringing awareness and support to the world of addiction. Through the establishment of the Iran Recovery Center and Ayeneh Foundation, a non profit organization with over fifteen years of public service, as well as through educational websites, educational seminars and conferences around the world, he has been devoted to the promotion of education, awareness and knowledge with regards to human rights and a drug-free lifestyle. One of the educational websites he has gifted to his countrymen is http://www.behboudichat.com which is intended to provide an opportunity to all those who do not have access to meetings to participate in the live meetings that are scheduled throughout the week all around the world in Persian. In consideration of Mehdi Saeedi’s artworks, a large number of them have been selected for exhibition in many prominent museums, collections, major domestic and international exhibitions worldwide. They have also been published in several reputable international magazines. Mehdi won several prestigious and well-grounded awards both locally and internationally resulting in becoming known as the most awarded Iranian graphic designer in Iran’s graphic history Among which are: Grand Prize, Taiwan International Poster Design Award, Taiwan, 2007; Grand Prize, “Five Stars Designers’ Banquet”, International Invitational Poster Triennial of Osaka, Japan, 2009; Top Award, 15th International Invitational Poster, Colorado, United States, 2007; First Prize, 12th International Poster Triennial, Ekoplagat ́11, Slovakia, 2011 and Gold Medal in “Graphis poster annual 2013”, USA etc. A second book, “From Script to Calligraphy: Collection of Mehdi Saeedi’s Posters” , is a collection of Mehdi’s works in a decade and was published in Germany in 2008. In 2013, Mehdi published the book “From Contour to Calligraphy” . This book is a collection of his works through 14 years of professional efforts demonstrating Mehdi’s approach to figurative calligraphy (Zoomorphism or Tasvir-Negari) and Graphic Design. The content of the book is divided into three sections. The first section consists of art pieces that inspired by traditional Persian calligraphy, and the second and third sections are based on works utilizing contemporary design titled “Modern Persian1” and “Modern Persian2”. This book begins with introductions by renowned visual artists including: Alain Le Quernec (AGI) from France, Rene Wanner and Niklaus Troxler (AGI) from Switzerland, U.G Sato(AGI) from Japan and Aydin Aghdashloo from Iran. Kateh is a type of Iranianrice from Caspian region, which, unlike Polo/Cholo, is sticky and does not have Tahdig (the rice, bread or potato crust at the bottom, a traditional delicacy in Iran), though it does form a crust on the bottom where the salt and oil collect. Generally, Kateh needs half the cooking time of Polo-style rice and has a denser flavor due to the addition of butter or oil in the cooking process. Kateh is considered generally the most simple Iranian rice the ease and speed of cooking makes it popular for casual dinners. It is also the traditional dish of Gilan and Mazandaran.